Bring water and chicken broth to a boil in a steamer. Add carrots and fennel to steamer basket. Steam7-8 minutes or until tender. 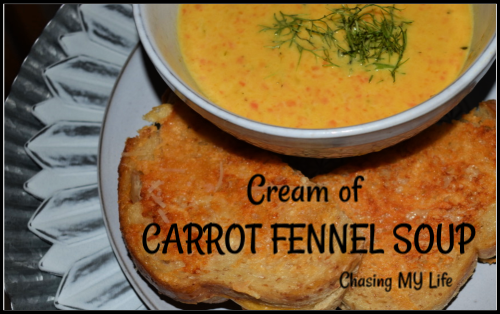 Remove carrots and fennel to cool slightly. Save broth, adding enough water to measure 2 cups. Set aside. Add the carrots and fennel to food processor with 1 cup of the steaming broth. Blend until smooth. Add shallot, sauteing until soft. Add the garlic, sauteing until fragrant. Sprinkle in flour, stirring to blend until golden. Slowly whisk in the whole milk, heavy cream, cream of sherry and remaining 1 cup of broth. Stir in thyme and simmer 10-15 minutes, stirring occasionally, until mixture thickens. Top with chopped fennel fronds.